1966 Batman B Series Blue Bat is the third illustrated set of the year for the franchise. 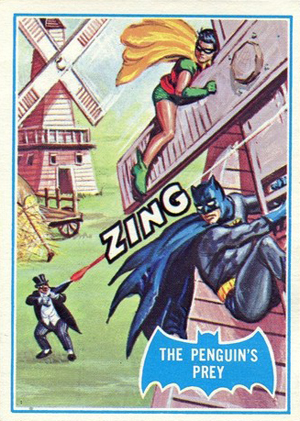 Driven by the enormous popularity of the television show starring Adam West and Burt Ward, Topps would go on to release five Batman sets that year. Once again featuring illustrations by Norman Saunders, 1966 Batman B Series is also referred to as the Blue Bat set because of the colored icon that has the card's caption. Besides this blue logo, B Series cards have a thin blue border around the outside of the image. 1966 Batman B Series has two distinct back variations. Puzzle backs are the most common. These cards have a short description and can be put together to form one of six different puzzles. Blue backs, or cowl backs, have a large, blue Batman logo with a more extensive writeup. During the 1960s, Batman didn't have the same serious tone the more modern interpretations have. This is reflected on many of the card images, many of which are downright bizarre. From Robin riding down a rainbow to the Dynamic Duo fighting dinosaurs, this set takes campy to a new level. 1966 Topps Batman B Series Blue Bat has 44 cards. Batman BLUE BAT COWL 1966 Complete (44 44) TOPPS USA card set EX++ condition !! 44B Riddler Robs a Rainbow!